A fabric set of 20D Nylon Ripstop and 30D Nylon Taffeta is ultra-plush for a supreme sleep experience. Premium 800 FP down is ultra-packable, hydrophobic, PFC-free, and 100% Responsible Down Standard (RDS) Certified for traceability throughout the supply chain. 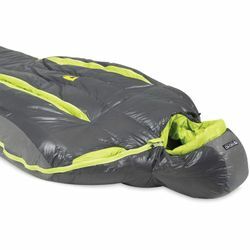 Waterproof and breathable footbox and hood protect against tent wall condensation. Tailored patterning is designed for optimal thermal efficiency and packability. Premium down insulation is treated with Nikwax™ for waterproof security on the trail. Body-mapped tapered core is designed for an ideal fit with no wasted space. Full-length YKK zipper with snagless baffle construction and draft tube seals warm air in.